CELLS, a consortium in charge of building the synchrotron in Barcelona, has chosen the SMT8036 kit to design and build a prototype of digital low level RF system for the ALBA Synchrotron. 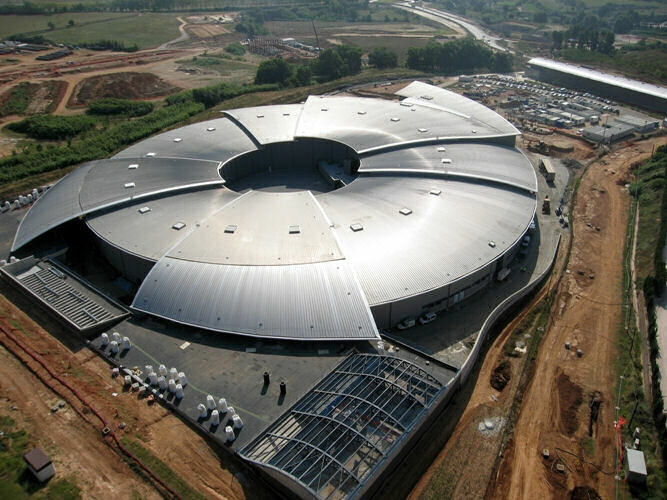 ALBA is a circular-shaped machine, called a synchrotron, which uses arrays of magnets, called insertion devices to generate bright beams of synchrotron light. ALBA will be located near Barcelona. A synchrotron is an accelerator of electrons. The electrons are maintained in a circular ring by magnetic field and produce X-Rays tangentially to their trajectory. These X-Rays are used by several beamlines located around the storage ring to analyse samples for chemistry, materials science, magnetism, life sciences, macromolecular crystallography and industry. The Sundance system is intended to be used to regulate amplitude voltages (within 0.1% rms), phase (within 0.1° rms) and resonant frequency of the RF cavities of the accelerator machine. This type of cavity restores the lost energy of the electron beam due to synchrotron radiation and they also focus the X-Ray beam longitudinally. The 500MHz RF input signals are down-converted to 20MHz IF by a front-end module. The IF signals, which are equivalent in phase and amplitude to the RF signals, are sent to the ADCs to be demodulated into I/Q components. The FPGA regulates the amplitude, phase and resonance frequency of the cavity with control and tuning loops. The DACs transform the IF control signals into analogue signals that are finally up-converted to RF in a second analogue module. The DSP connected to the FPGA reports 14 diagnostic signals, generated in the FPGA during the processing stage, to the Host PC. All of the I/Q reference, I/Q cavity, I/Q computed and I/Q control actions signals are stored and displayed using a MATLAB interface.